Comment on ‘De Katholieke Universiteit in 1932-1933’ by Corjo Jansen. For the original text see: De Katholieke Universiteit in 1932-1933, for the English translation of relevant fragments see: Fragments The Catholic University in 1932-1933. On 17 October 1923 the R.C. University in Nijmegen had opened its doors. The enthusiasm over having its own university could barely be put into words by the Catholic media. The R.C. University formed the final piece in the emancipation of the Catholics in the Netherlands. The start of the new university was modest. It numbered only three faculties: The Faculty of Theology, the Faculty of Arts and the Faculty of Law. They were required to educate intellectuals who could take up an important position in Dutch society. In this regard, the expectations in respect of the Faculty of Law were particularly high. Titus Brandsma was professor in the Faculty of Arts. He had an unparalleled extensive teaching and research portfolio. In the opening of his final speech as rector of 18 September 1933, he recalled with feelings of joy and gratitude the glorious day of 17 October 1923, then nearly ten years earlier. Such a brief review of the founding year of the university fitted extremely well with the character of the final rectorial address. In the 1930s the governance of the Dutch universities was still relatively modest. It consisted of two professors who fulfilled the role of rector magnificus (the chair of the senate of the body of professors) and secretary, respectively. They remained in function for one year. The secretary was the intended successor to the rector. In principle, a rector gave two speeches: one when taking up office, concerning a subject from his area of study, and one when standing down, concerning the ups and downs of the university in the year that he was rector. In Nijmegen the final speech by the rector took place during the opening of the academic year, on the third Monday of September. During his opening speech as rector in 1932 Titus had spoken about the Concept of God in modern times. The intention had been that he would pass the rectorship to J.H.P.M. van der Grinten (1885-1932), professor of Constitutional and Administrative Law. However, he died prematurely at 47 years of age. Titus paid homage to him in various Catholic newspapers and also later on in his final rectorial address. ‘The year is dominated by a deep mourning over the loss of one of its most honoured and loved Professors. At the start of this academic year we gathered around the grave of Prof. Mr. Dr. Van der Grinten and we were there with so many at this funeral which simply showed that the R.C. University had suffered a great loss’. Van der Grinten was succeeded as secretary by another professor of the Faculty of Law, E.J.J. van der Heijden (1885-1941). He would succeed Brandsma as rector. His rectorial commencement speech – very well known in legal circles –was entitled Natuurlijke normen in het positive recht (Natural Norms in Positive Law) (1933). The final rectorial address of Brandsma included the necessary figures (about the number of Nijmegen students and the number of Nijmegen doctorates in the academic year 1932-1933, the number of purchased and gifted books, and such like). He also spoke about the appointments of new professors, his visits abroad (for example to Milan and Rome), his (foreign) visitors and the big-wigs from the national political arena who honoured the university through their visits, such as Prime-minister Charles Ruijs de Beerenbrouck (1873-1936) and T.J. Verschuur (1886-1945), at that time Minister of Economic Affairs and Employment in the third cabinet of Ruijs de Beerenbrouck. Finally, a highlight was the meeting with the Pope, Pius XI, known for establishing universities across the world. He expressed his great interest in the Nijmegen university and especially his ‘love and interest’ for the theological faculty, ‘for which he would be glad to see the dawning of an era of great flourishing particularly through the increase of the number of students’. Another highlight for Titus Brandsma was the presentation of the first golden honorary medallion of the university to a liberal arts student, Antonius Angelus Weijnen (1909-2008), for his dialect-geographical research into the boundary and the most important differences between the West and East North Brabant dialect. Although the greater part of the rectorial farewell speech included a fairly dry overview of the events, the facts and the ups and downs of the Catholic University, as was the intention, Brandsma addressed a number of substantive subjects: the founding of the university, the level of difficulty of studies at Nijmegen and the comparatively low number of doctorates; the students who had strayed into the right wing authoritarian body of thought from the early 1930s; and the importance of university education, also in times of economic crisis. In this contribution, I briefly go into each of these subjects. At the start of his farewell speech, Brandsma lingered somewhat over the founding of the university. He saw it as a pinnacle of the fight for freedom of education, in all its forms, which had gone on for many years. In order to silence critics, the professors of the university had set the bar high, perhaps sometimes somewhat too high. ‘It would be unjust if Nijmegen went too far in this and consequently discouraged students who belong here. Within reasonable limits it is nevertheless gratifying that people in Nijmegen set the standards high and that, overall in university circles, it is recognised that in Nijmegen the required standards safeguard a high level of academic education’. The start of a second denominational university was not received with joy by everyone in the academic Netherlands. In his rectorial farewell speech of 1924, the rector magnificus of Amsterdam, R.C. Boer (1863-1929), said that there was a ‘natural’ yawning gap between a denominational university and a university which is free of religious belief. At a denominational university, enslavement of free thinking and free judgment ‘under an alien will’ always threatened. A denominational scholar was not permitted to retract his judgment on a number of very important points. He had to submit himself fully to the ‘servanthood’ of a religious community. In that way, scholarship was governed by control. However, the ‘peace’ in the Netherlands was founded on the equal rights of public and private education. Boer regarded this peace more highly than driving a principle to extremes. For that reason, he had reconciled himself to the founding of denominational universities. An anonymous lead article in the Catholic journal De Tijd responded in outrage to the ideas of Boer. Liberal sectarianism was responsible for the course of events. It considered ‘Catholic’ and ‘stupid’ to be synonymous, and consequently there were hardly any Catholic professors in other universities. ‘Our higher education must be delivered from the libertine shackles in which it could never breathe freely. For the mentality, the atmosphere, the cultural life, created around our public high schools, was completely liberal and stifling for scholarly freedom’. Also, in legal circles concerns were raised against the founding of a new denominational university. The Utrecht professor in criminal law, D. Simons (1860-1930), wanted to bar the graduates of the Catholic university from being appointed as a single judge (who makes legal judgments without colleagues), because they were educated with too much bias. They lacked contact with the world outside of their own circle, certainly when the university would be established in a ‘Catholic centre’. This criticism over the founding also meant that the professors did indeed place high demands on their students. They wished to be taken seriously by their colleagues in the country. In particular, the professors of law had the reputation of being stringent. The percentage of passes for the legal doctorate exams did not exceed 70 percent. It was higher with the two other Nijmegen faculties. According to the professor of ‘Aesthetics’ and History of Art at Nijmegen, Gerard Brom (1882-1959), this stringency was attributed to a final remnant of the Roman Catholic sense of inferiority, which meant that the professors, in his opinion, ‘anxiously pushed the demands too far’. Therefore it was no surprise that in his final rectorial speech to his colleagues and the world outside, Titus Brandsma on the one hand emphasised the high standard of education and the outstanding quality of the professors at Nijmegen but on the other hand, in a covert manner, warned his colleagues that they should not go too far in their demands. Another concern of Titus Brandsma was that the number of doctorates at Nijmegen University in the past ten years had been too low. Of the 272 graduates only 38 were admitted to the degree of Doctor, a number which was lower than the national average (5.5% compared to 6.9% up to 9.8%). According to Titus, those who did not study for a doctorate missed out on the complete academic formation. A doctorate was indeed not required to teach at a secondary school, but someone who had not studied at doctorate level was not able to carry out scholarly research independently. Brandsma pointed out that the Masters degree in itself, meant that the graduate is called and is admitted to a higher degree. Therefore, he regarded it ‘not actually to be a degree in the ordinary sense of the word’. Also Brabers, in the history of the faculty of law, mentioned this low number of doctorates before the war. At the same time, he argued that the emancipatory task of the university had not really suffered from it’. 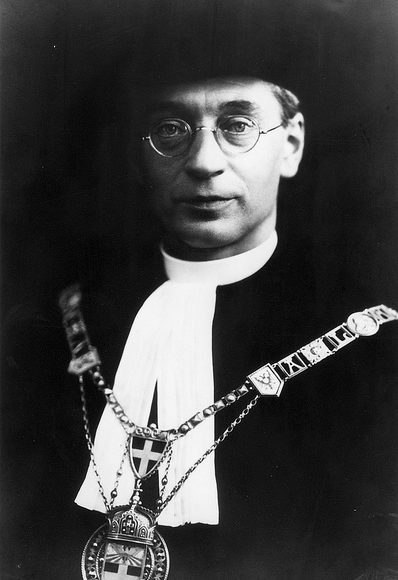 In a speech on 4 August 1933, which Brandsma gave as rector during an International Congress for Secondary Education, he impressed on his listeners that general development was of the highest importance with regard to studying at a university. Secondary school education needed, more than it did now, to give some space to the autonomy of the pupil. At the universities students were left to their own devices. Now they often needed six months, sometimes even a year, to adjust to the new way of studying. Another demand was that the secondary schools needed to arouse love and passion for learning, without which studying at university was hardly conceivable (even though the majority of students did not arrive at university ‘out of pure love for learning’). On 30 January 1933, during the rectorship of Titus Brandsma, Adolf Hitler (1889-1945) became Chancellor of Germany. Already from the start of his accession to power, it was clear that the Jews would become the target of his regime. Titus saw to his great regret that some students had strayed into radical territory and that statements by them had reached the (student) press. A German newspaper, Fridericus, denounced the words of Titus Brandsma concerning the illusion of weakness of the German people. The Germans did not battle with the Jews as a house owner does not with a burglar. ‘Quite the reverse. We throw him out.’ Criticism of Brandsma’s words was not restricted to Germany. An anonymous Dutch writer denounced his stance in De Nieuwe Gemeenschap. De Tijd very much regretted the attack: it set Roman Catholics against Jews. Around the middle of 1936, Titus Brandsma had for some time been a member of the ‘Comité van Waakzaamheid van anti-national-socialistische intellectueelen’ (‘Committee of vigilance of anti-national socialist intellectuals’). Later this year the Catholics would again leave this committee. I now let rest the further battle of Titus Brandsma against national socialism. Many people are sufficiently acquainted with this, especially the role which he played in his capacity as religious advisor to the Dutch Roman Catholic Association of Journalists. The end is also known. The occupying forces arrested him in January 1942 and Titus died a gruesome death on 26 July of that same year in Dachau. ‘I [Titus Brandsma] do not on the whole fear the great onrush to our university, greater than was expected. I applaud that, because it gives me the assurance that with this, the vitality and the energy of our Catholic population will grow to a great degree’. Titus Brandsma was known for his great zest for work and zeal. His final speech as rector also evidenced this. During the rectorial year he worked hard, travelled a great deal, was able to receive and meet special guests, attended a mountain of ceremonies, gave lectures etc. One of these lectures during his rectorship focused on the subject of Christian pragmatism. He was of the opinion that, ‘in this bleak time’, there was space for optimism through the power of God’s providence. With Titus’ closing words of this speech, will I also end. Titus interiorized these words. He has become a shining example for many, in times of great need and still today. ↑ Translation of: Corjo Jansen, ‘Titus Brandsma en zijn rede bij de overdracht van het rectoraat van de Katholieke Universiteit Nijmegen’, in: Anne-Marie Bos (ed), Titus Brandsma. Spiritualiteit dichtbij in veertien teksten, Adveniat, Baarn 2018, p. 124-133. Corjo Jansen is professor of Legal History and Civil Law, Radboud University in Nijmegen, as well as chairperson of the board of the Titus Brandsma Institute. ↑ Brandsma was professor of History of Philosophy (except for that of Greek and Roman), Natural Philosophy, Natural Religious Doctrine, Philosophy of History and History of Mysticism, especially of Dutch Mysticism. ↑ Titus Brandsma, De Katholieke Universiteit in 1923-1933, N.V. Dekker & Van de Vegt and J.W. van Leeuwen, Nijmegen-Utrecht 1933, p. 3. See fragment I in: Fragments The Catholic University in 1932-1933. ↑ See in detail Jan Brabers, Een zoet juk. Rectores magnifici van de Radboud Universiteit over hun rectoraat 1923-2014, Nijmegen 2014. In p. 36-37, Brabers discusses the final rectorial address of Brandsma. ↑ Titus Brandsma, Godsbegrip, N.V. Dekker & van de Vegt en J.W. Leeuwen, Nijmegen-Utrecht 1932. See: fragments speech Concept of God. An extensive reflection on this speech ‘9e Dies Natalis R.K. Universiteit. Godsbegrip. Rectorale Rede Prof. Dr. T. Brandsma O.C.’, in: De Tijd 17 October 1932, p. 2. See K. Waaijman, ‘Titus Brandsma’, in: Nijmeegse Gezichten. Vijfenzeventig jaar Katholieke Universiteit, Nijmegen 1998, p. 53 et seq. and A. Jacobs, Kroniek van de Karmel in Nederland 1840-1970, Hilversum 2017, p. 301-303. ↑ De Katholieke Universiteit, p. 9. ↑ J.B.A.M. Brabers, De Faculteit der Rechtsgeleerdheid van de Katholieke Universiteit Nijmegen 1923-1982, Nijmegen 1994, p. 14 et seq. And C.J.H. Jansen and G. van Solinge, ‘Egidius Johannes Josephus van der Heijden (12 augustus 1885 - 24 mei 1941)’, in: idem, Verspreide Geschriften van E.J.J. van der Heijden, Deventer 2001, p. XIII et seq. ↑ De Katholieke Universiteit, p. 19. ↑ De Katholieke Universiteit, p. 20-21. The research concerned a response to the competition of the Faculty of Arts and Philosophy. Weijnen was appointed professor on 1 September 1958 in Dutch and Indo-European linguistics. ↑ De Katholieke Universiteit, p. 5. See fragment II in: Fragments The Catholic University in 1932-1933. ↑ ‘Professor Dr. R.C. [de] Boer en de R.K. Universiteit’ and ‘Een Rector Magnificus tegen de R.K. Universiteit’, De Tijd 17 September 1924, front page. ↑ [D. Simons], ‘Bezuiniging en rechterlijke macht’, Weekblad van het Recht</i> 10.994 (1923), p. 1-2. ↑ Brabers, De Faculteit der Rechtsgeleerdheid van de Katholieke Universiteit Nijmegen 1923-1982, p. 108 et seq. ↑ Gerard Brom, Dies natalis. Stichting van de Katholieke Universiteit, Nijmegen-Utrecht 1955, p. 126. ↑ De Katholieke Universiteit, p. 26. ↑ Brabers, De Faculteit der Rechtsgeleerdheid van de Katholieke Universiteit Nijmegen 1923-1982, p. 115 et seq. ↑ ‘Internationaal Congres Katholiek Middelbaar Onderwijs’, Haagsche Courant 4 August 1933, p. 13. ↑ See among others C.J.H. Jansen, ‘Nederlandse protesten tegen het Duitse antisemitisme in de Jaren dertig van de vorige eeuw en de rol van de Rooms-Katholieke Kerk daarin’, RM Themis 6 (2016), p. 289-291. ↑ De Katholieke Universiteit, p. 22-23. See fragment III in: Fragments The Catholic University in 1932-1933. Brabers, Een zoet juk, p. 36. In my opinion, Brandsma not only referred to the attraction which politically extreme right notions had on the students, but also to the success of religious reactionary movements for students which rightly searched for deepening of the faith and turned away from ordinary student life. Titus Brandsma did not use for nothing the words ‘an optimistic demand for perfect perception of the Christian ideal’. He chose his words so carefully that he extended his concerns over both aspects of radicalism. ↑ K. van Berkel, Academische illusies. De Groningse universiteit in een tijd van crisis, bezetting en herstel, 1930-1950, Amsterdam 2005, p. 81. ↑ Titus Brandsma, ‘De waan der zwakheid’, in: Stemmen van Nederlanders over de behandeling van Joden in Duitschland. Comité voor Bijzondere Joodsche Belangen, 1935. Also published in: Provinciale Geldersche en Nijmeegsche Courant 7 February 1936, p. 2. See also ‘Tegen het anti-semitisme’, in: Het Vaderland 29 January 1936, Morning paper B, p. 5. These words of Titus are quoted in a piece with the title ‘Duitsch recht. En zijn consequenties’, in: De Tijd 21 March 1936, Evening paper. Cf. also H.A. Poels, ‘Jodenvervolging en katholieken, in: De Tijd 31 January 1936, front page. ↑ ‘Het anti-semietisme in Duitschland’, in: De Tijd 12 February 1936, Evening paper, p. 5. ↑ ‘Prof. Titus Brandsma in de Duitsche Pers’, in: De Tijd 21 February 1936, Evening paper. ↑ ‘’n Triest verschijnsel. Roomsch tegen Jood’, in: De Tijd 25 February 1936, Evening paper, p. 5. ↑ For some modern literature, see: A. van Liempt, Aan de Maliebaan. De kerk, het verzet, de NSB en de SS op een strekkende kilometer, Amsterdam 2015 and also the chapter about Titus Brandsma in E.M.H. Hirsch Ballin, Tegen de stroom. Over Mensen en ideeën die hoop geven in benarde tijden, Amsterdam 2016 and Jacobs, Kroniek van de Karmel in Nederland 1840-1970, p. 90 et seq. and p. 500 et seq. ↑ De Katholieke Universiteit, p. 28. ↑ De Katholieke Universiteit, p. 29. ↑ Ibidem. See fragment I in: Fragments The Catholic University in 1932-1933. ↑ Titus Brandsma, ‘Christelijk pragmatisme’, in: De Tijd 13 June 1933, p.2 (‘De waarheid leeft’).